Right after my promotion to shodan years ago I realized somebody slipped up in the ordering department when I tied my new black belt around my waist. I've always taken a size 5. Maybe my instructor thought I would grow into the size 9 that was now dangling halfway down my shins. Fortunately he had a 5 on hand. "I hope it fits like a bow tie" he remarked. Funny guy. It didn't, and I'm happy to say it still fits just fine. I'm wondering how many masters have had to pick up longer belts through the years to accommodate an increase in midsection girth. 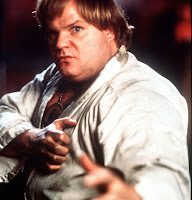 It's a bit disheartening to see a 6th dan walking around with a build like Chris Farley. Obesity has become the new disease for the modern age. At no other time in history have so many people been so overweight. Much of this begins during childhood, and legislation has already been passed to remove vending machines filled with "bad" snacks from public schools. Healthy treats such as low glycemic fruit juices and other fat free items are available. But overindulging in anything, even if it's touted to be good for you, defeats its original purpose. I remember seeing an ad for a local martial arts school chain that displays the now trite before-and-after images of flab to firm washboard abs, courtesy of karate training. Almost every exercise gizmo on the infomercial market targets the stomach. You can do crunches and leg raises until you're blue in the face, but if you're taking in more calories than you can burn the excess gets stored as body fat. Nevertheless, working the midsection is imperative as it is the seat of the hara. Having strong abdominals also offsets the possibility of wrenching the lower back, another ailment of the masses. In addition to the all-important diet, I strongly advocate some kind of progressive resistance training. Some myths regarding weight training don't die easily. One martial artist wrote online that he felt bodybuilding was detrimental because eventually the hard earned muscle could turn to fat! This isn't even remotely possible. There's so much information available on proper diet that I won't bother getting into that here. I will say that certain faddish diets do more harm than good. Low carb or crash diets may cause a rapid decrease in weight, so much in fact that lean body weight (i.e. muscle) is sacrificed, thereby slowing one's metabolism. As such I don't believe in any type of radical dieting. These height and weight charts that I've seen are speculative. If you're eating properly, training consistently and getting adequate rest you're doing good. Still, I like to cheat now and then. And who doesn't? Recently I indulged myself with something called a Frappuccino. Unbelievably good. Lots of caffeine, sugar and cream. Look, if you're going to be bad do it right! There are a variety of charts available depending on weight, height and such. eat right, eat a bit less, exercice. And to reply to the bodybuilding comment: Bruce Lee, who's reputation I don't have to mention, was heavily into weight training. Training the right muscles and using them goes a long way to devellop better movements. Abs and back muscles are very important. Wonderful comment...I have always been a little disturbed by the girth of some yet there are those who have a larger midsection who can dust the floor with anyone. I believe that girth is not necessarily a bad thing depending on overall phy fitness. You can tell when it is just fat and unhealthy. There is one first generation Isshinryu practitioner, rest his soul, who did a tape and it is disappointing to see him out there with that weight problem trying to say how karate keeps you healthy. Much like the doctor who chain smokes while telling the patient they have to quit :-) Doesn't carry much weight. Read Omnivores Dilemma, it is an eye opener. Excellent post John. This is very true. One thing I've learned from my months at physical therapy is that weight is more than detrimental to just the internal organs. The majority of people who are there for knee replacements and other issues like that are very overweight. Overweight sensei happen to be a pet peeve of Kyoshi Hayes and he talks about nutrition extensively. It is so very important for overall health and also as a martial artist to make it a part of your life in more ways than just kicking and punching. I too have a Frappucino weakness! And it bothers me the same as you when you see an instructor walking around that needs to loose some significant weight. After all, it seems inpossible to me to go "all out" in karate and still be overweight. That doesn't send a good message to the students. And to reply to the bodybuilding comment: Bruce Lee, who's reputation I don't have to mention, was heavily into weight training. Lee was ahead of his time in most subjects. Especially in the 60s, most athletes were forbidden to lift weights, as if it were a form of cheating. No it certainly doesn't, and that's precisely the classic example I had in mind for this article. Overweight sensei happen to be a pet peeve of Kyoshi Hayes and he talks about nutrition extensively. Hayes is in his sixties now and still looks quite fit. I know he's involved in the vitamin/supplement industry. If you're going to take the title of master, you should be held as a role model in all areas, including physical appearance. I really think more instructors should be well versed on the subject of nutrition, especially in this day and age. I too have a Frappucino weakness! Isn't it good? I think mine was made with caramel. I'm basically a coffee guy, but once in a while I'll try something exotic like that. I think there's more to training tan practice. You have to not only eat right, but get enough rest; and do a thousand little things that will keep your body healthy and mind clear. Excellent points all around. When I started training in BJJ, I was a good 220 lbs and about 25% body fat. In addition to the exercise, I started really thinking about my diet. The only fundamental changes I made were to eat smaller meals more often, so I'm never hungry, to watch the sugars I eat and to drink plenty of water. Just these simple changes in my diet, in addition to stimulating my metabolism through regular exercise dropped 40 lbs in a matter of 6 months, and I've walked around at ~185 ever since. The only fundamental changes I made were to eat smaller meals more often, so I'm never hungry, to watch the sugars I eat and to drink plenty of water. I believe the idea behind eating smaller meals more often is that it produces less insulin in the body, stabilizing blood-sugar and somehow this all curbs the appetite at the same time. Supposedly it's the way our ancestral hunter-gatherers ate. I eat two main meals per day with fruit, nuts and protein shakes in-between. I should drink more water though, especially with all the coffee I drink. (Caffeine's a diuretic.) But I also read that drinking too much water can be a problem as it can dilute the digestive enzymes and HCl in the stomach. FYI: I read that coffee is actually the most significant source of anti-oxidants for most Americans. Basically, teaching burns fewer, calories than doing. I tried doing exactly what the students were doing in order to maintain that same exercise level, but then I found I was cheating them. I need to concentrate on them to help; and with a job and kids (single dad), it's not like when I was young and had so much free time. Combine that with the natural slowing of the metabolism as one ages, and I can understand why even some of the excellent teachers have to get a bigger belt. It just takes discipline, like anything else. And I 100% agree -- diets are foolish. A diet is something you go off of, eventually; you simply have to change habits, and follow the math of calories in/energy out. There's no mystery to it, and no magical fruit/pill/hypnosis that will fix it. I read that coffee is actually the most significant source of anti-oxidants for most Americans. I remember seeing that someplace. I can believe it. In a similar vein I saw a figure that puts potatoes as the most consumed vegetable in the US. The reason: French fries. Good ol' American health consciousness. Really.. bringing up the amount of fruits and vegetables in one's diet not only lowers the amount of calories, but also increases all of the cancer fighting agents, minerals, and vitamins that you need to lead a healthy life. I agree with you that a Martial arts instructor should work towards living a healthy lifestyle, and keeping themselves in as good a shape as their age, and body type can offer. It might be difficult for them to find time to train as they have to juggle the schedule of classes. How would a highly demanded upon Sensei find time for him/herself to train? Disclaimer: I am not a nutrition expert. I do not have any recognized certification in discussing various foods to eat.